Biography: The Aramalla family has made Jesus Young Army Ministries a family affair. Paul Raju's father, Alfred, is the ministry's senior pastor, but because of his age, Paul has stepped up to take charge. Prameela is the youth pastor. 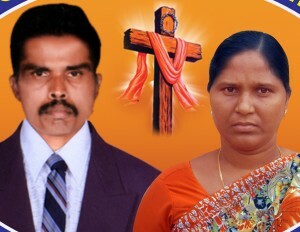 Their eldest son Udaya conducts the children's ministry which includes helping the children save money through the banking system, Sunday School and Bible coaching so the children can compete in competitions in different categories. Younger son Vamsi is studying to receive a Bachelor of Science degree with a nursing facility and will help establish a nursing ministry in their church. The church has daily prayer, receiving many phone calls with prayer requests. Paul tells us that God has done so many miracles through their prayer ministry. "We are very happy to say that many sick are recovered and have come to our Lord." The mission of the church is to save the unsaved, to develop youth seminars, to reach out in downtrodden areas and to give help to the needy in the name of Jesus. Strengths: Paul and Prameela have servant's hearts and a strong desire to help those in need. Family:Paul and Prameela have two adult sons, Uday Kiran and Vamsi Kiran.